Tony Romo of the Dallas Cowboys holds the ball under pressure from the Philadelphia Eagles at Cowboys Stadium on Nov. 27 in Arlington, Texas. UPDATE (Dec. 14, 11:04 a.m.): The interactive tables above have been updated to include the results of Thursday’s ARZ-STL match-up, and that game has been removed (the text of the article has not been updated). 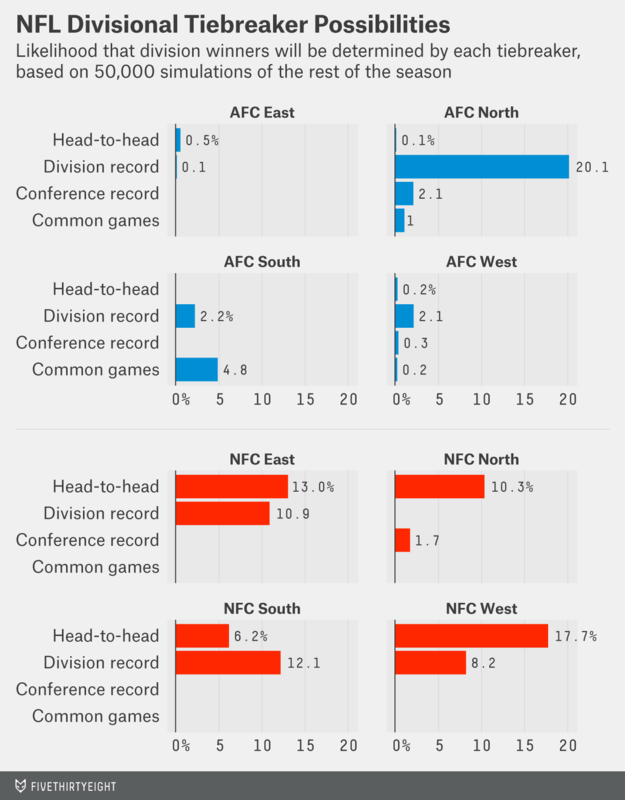 The intricacies of the NFL playoff race can make for uneasy alliances. Going into last week’s games, the numbers dictated that Dallas Cowboys fans should have been rooting for a Philadelphia Eagles victory over the Seattle Seahawks, because that would have maximized Dallas’s playoff chances. Understandably, Cowboys fans were somewhat resistant to the idea of rooting for a bitter division rival. The NFC East hate can flow freely this week, though. The Cowboys visit Philadelphia on Sunday night in a game with significant playoff implications. The Cowboys’ playoff chances climb to 84 percent with a road victory but drop to 36 percent with a loss. An Eagles victory would all but assure them a playoff berth, resulting in a 96 percent probability of both postseason play and a division title. An Eagles loss and the playoffs become a 50-50 proposition. That’s enough swing to make the Dallas-Philadelphia matchup one of the most important of the week. As with some elections, a coin flip is a possible playoff tiebreaker.2 But seeing as how the NFL playoffs are of far greater importance than representative democracy, there are multiple layers of redundancy in the NFL tiebreaker rules. Depending on the situation, there are 10 or 11 tiebreakers that would first have to fail before the league defaults to random chance. 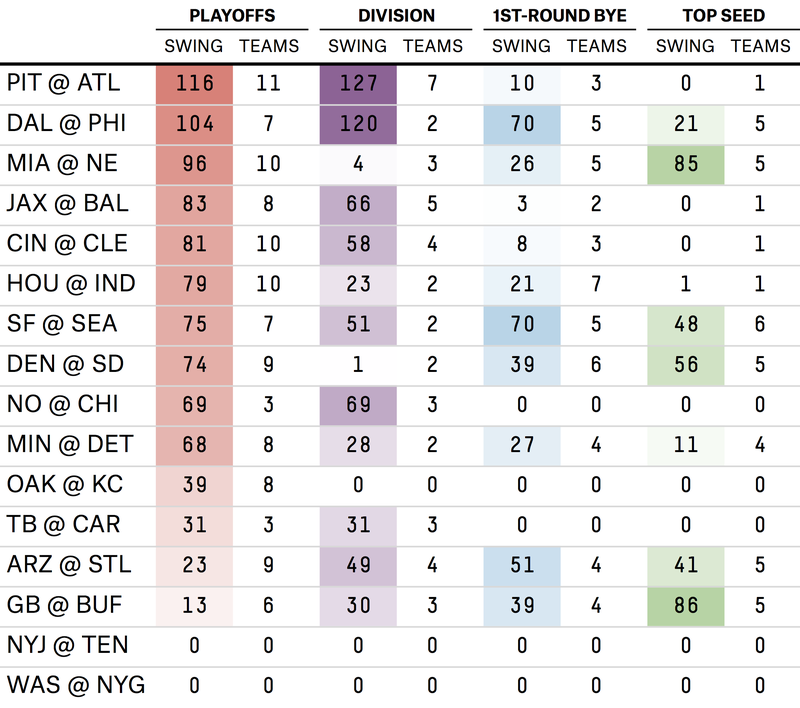 We took the 50,000 simulations used to produce this weekly feature and summarized how often each tiebreaker was needed to break a tie for the division winner. The results are summarized below. For division ties, even with 50,000 simulations, we never progressed past the fourth tiebreaker, conference record. A head-to-head record is most likely to settle a tie in the NFC West this season. Seattle can sweep the season series against the Arizona Cardinals next week, but with the Cardinals a game ahead in the standings, that leaves a good chance of both teams finishing with identical records. Interestingly, head-to-head is unlikely to resolve any AFC North ties, but in most cases, division record seems to do the trick. The tiebreaking procedures for the wild card seeds are virtually identical to the divisional tiebreakers, with the key exception being that division record is not considered. 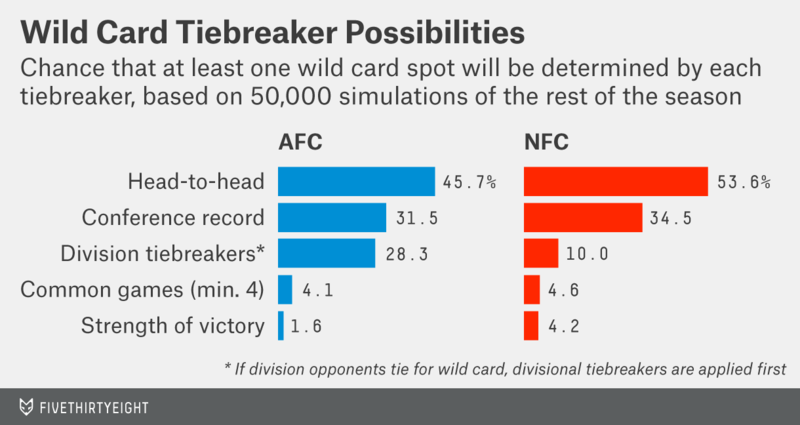 See below for a summary of potential tiebreakers needed for the two wild card races. In our market-based rankings below, a consensus appears to be emerging regarding the “elite” teams in the league. At the top, we have the Green Bay Packers, New England Patriots, Denver Broncos and Seahawks all within a point of each other. After that, there is a significant drop off, of more than three points, before we get to the next-best team, the Indianapolis Colts. 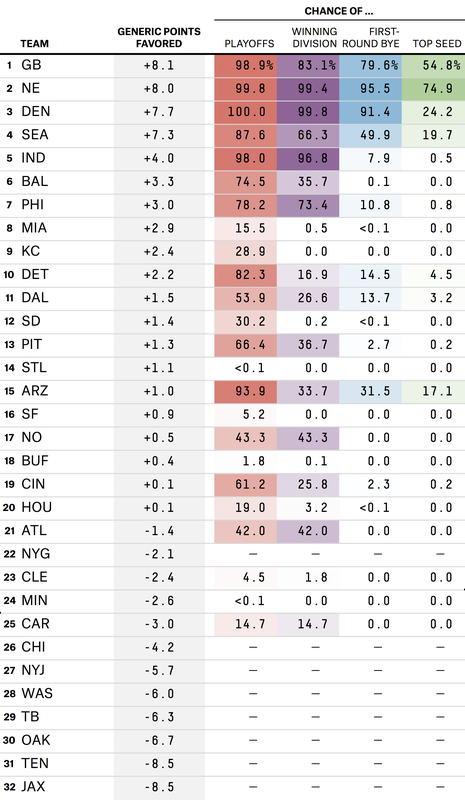 Note that the St. Louis Rams, despite having virtually no chance at a playoff berth, are now considered an above-average team in these rankings, placing them ahead of several teams in playoff contention. All of which we have painstakingly coded to bring you these numbers each week. Given the NFL’s use of coin flips for opening kickoffs and overtime, its use as a last-resort tiebreaker seems like a natural choice. In the NBA, unbreakable playoff ties are settled by “random draw,” more in keeping with their annual draft lottery. See a similar analysis from the co-author’s blog. At the midpoint of the 2013 season, a 10,000-run simulation needed the “points scored and points allowed within conference” tiebreaker 30 times. For one simulation, the “points scored and points allowed in total” tiebreaker was necessary.